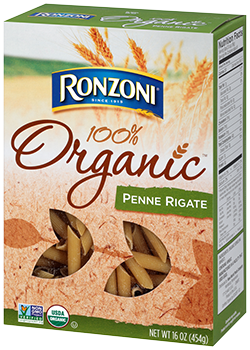 Introducing Ronzoni Organic™ pasta - the newest addition to the Ronzoni® family of brands. Ronzoni Organic™ pasta uses organic semolina wheat to bring you great tasting pasta. Coming from nature, Ronzoni Organic™ pasta helps you create a delicious pasta meal the whole family will enjoy. Serve organic goodness today! Available in 16 oz packages of penne rigate, rotini and spaghetti.